A good quality early 18th century walnut bureau of excellent colour and patination with fine figured veneers, cross banding and stringing. The bureau has a lovely interior with a false floored secret compartment behind the door and two further secrets which are accessed by removing the drawers adjacent to reeded pilasters which flank the door; a concealed spring (one each side) can then be pressed which causes the bottom of the pilaster to slide forward and reveal a secret drawer (again one on each side). 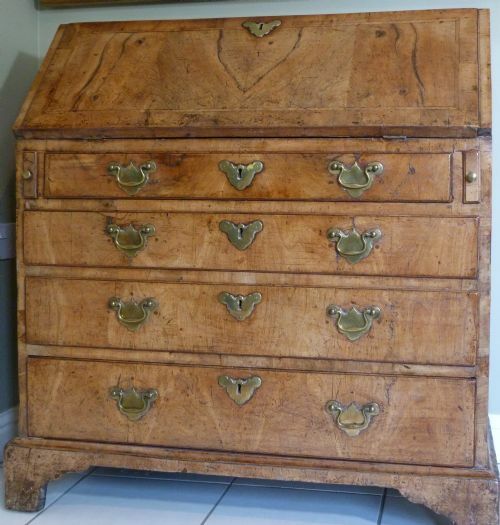 Such is the quality of this piece than even the secret drawers, not usually seen, are finely veneered. (see images 4, 5 and 6). The engraved brasses are original as are all the oak drawer linings. Condition is excellent, although inevitably, after 300 years of use, there have been a few small areas of veneer repair and three scratches to the fall. DIMENSIONS: 39.25 inches wide, 40.25 inches tall, 19.5 inches deep. PROVENANCE: Private Collection, West Country, England. An unusual large 18th c. double gated dropleaf French farmhouse table in chestnut of lovely colour; probably from Gascony. The split baluster legs open as supports for the leaves. Dummy drawers at each end. Size; height 32 inches, width 50 inches, depth 82 inches open (27 inches closed). An unusually small early 18th century walnut bureau, with fine veneers, excellent patination and beautifully faded. The sides are pine, of a good colour and, unusually and pleasingly, have not been later veneered. Drawer linings are oak with fine dovetails; escutcheons original but the handles are later replacements of the right type. Obviously there are one or two old damages after 300 years, but nothing significant..a small piece of veneer missing from the right hand back corner of the top; not easily seen. The strength of this piece lies in its small size, colour and patination; it really is a joy. There are keys for the fall and the little door within the bureau. SIZE: 35.75 inches wide, 39 inches tall, 19 inches deep. 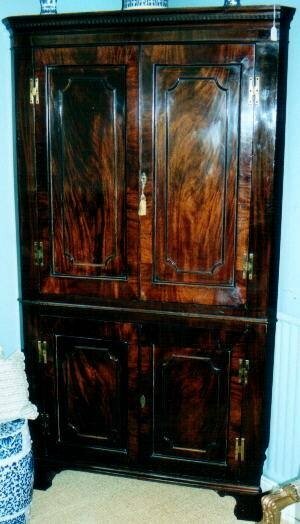 George III mahogany corner cupboard c.1770. A floor standing mahogany corner cupboard c.1770, with exceptionally fine figuring and colour and shaped shelves to the interior. The cornice is later as are the 'returns' to the sides which have been shaped for skirting boards. Originally the cupboard may well have been built into a grand house. An extremely handsome and useful piece of furniture. Size: 81 in. tall, 44 in. wide. 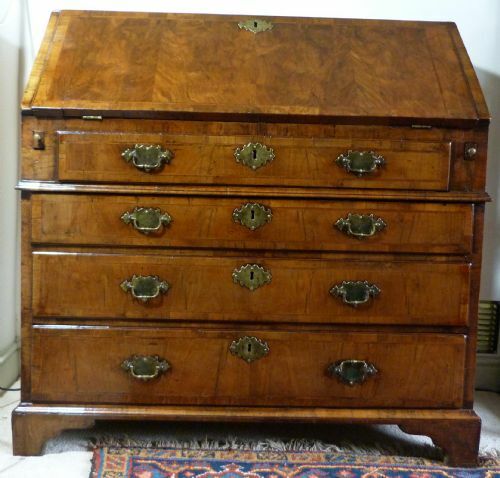 An impressive Spanish leather bound and brass studded domed chest on stand. 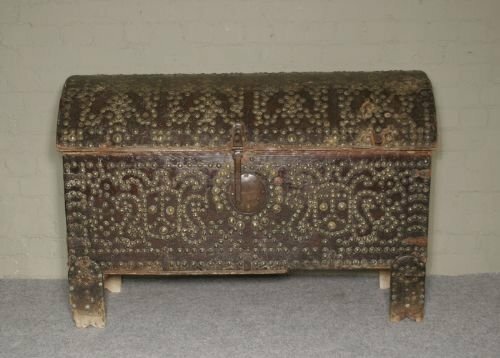 This highly decorative and rare 17th century coffer has the original iron carrying handles, ring and pin hinges and hasp and lock plate. The two piece stand was to keep the bottom of the chest off damp stone floors. Usually dome-topped chests need to stand well away from a wall to open, but this one is hinged two thirds of the way across the dome top and thus can stand flush with a wall. The sides and back are covered in plain, thick hide. This is an item that would protect its contents when travelling...the curved leather top shedding any rain water, yet clearly was highly decorated to use as a functional ornament in a great house, probably in the hall. SIZE: 50 inches wide, 22 inches deep, 33.5 inches tall (on stands), 26 inches tall off stands. PROVENANCE: A Northern England private collection. 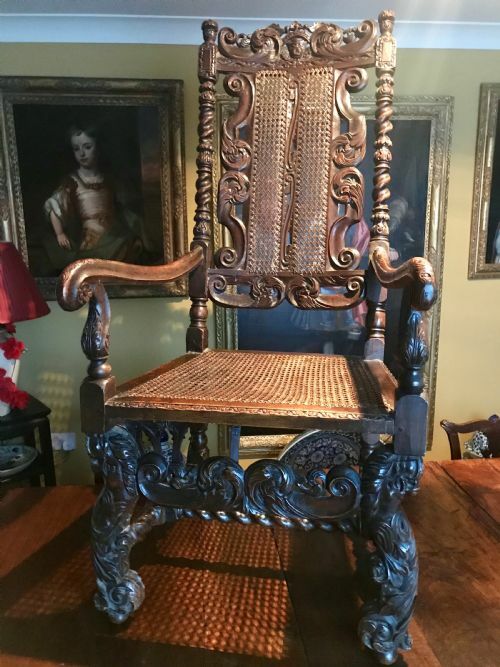 This chair is of excellent quality, with exceptionally fine carving and good colour, but constant use over the centuries has inevitably left its marks. As these once high status chairs became unfashionable in the 18th century they moved down from gentry houses to farmers and small merchants then into cottages, often being badly treated. This example has been skilfully restored and reconstructed and is firm, solid and ready to use for another 300 years. 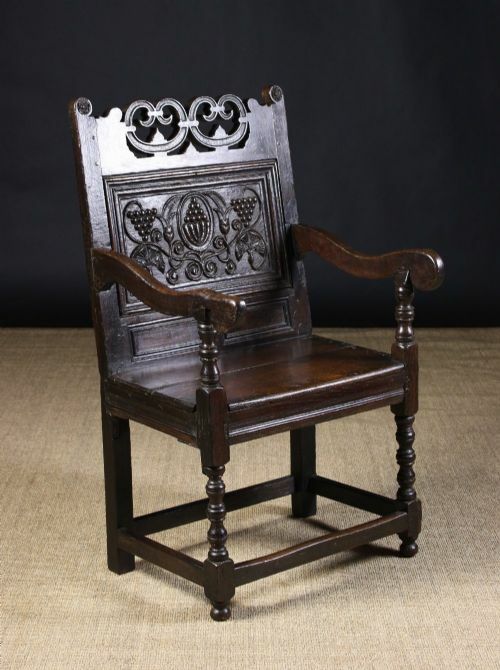 The pierced cresting and superbly carved panel back are typical of chairs from this area, and very similar examples can be seen illustrated in Victor Chinnery's book 'Oak Furniture: The British Tradition'. DIMENSIONS:39.5 inches tall, 22.5 inches wide, 20 inches deep. Oak side table c.1690-1720 and later. This very attractive side table may have started life as the base of a 17th century chest on stand, as time passed, chest and base were often separated.It is a lovely colour, patina and of excellent proportions. The top is later, the drawer has been rebuilt and the ball feet are replacements. The original brass escutcheon suggests a lock, but there has never been one; locks were very expensive and on country furniture they were not always fitted. The ends are panelled. 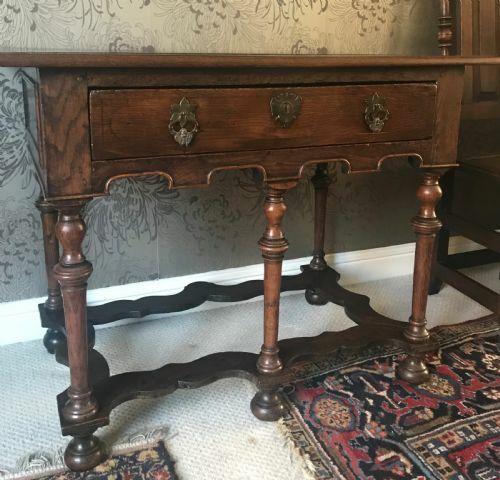 Clearly, this is not a piece for the purist collector, but it is a 300 years old piece of furniture that is beautiful, useful and sensibly priced. SIZE: 39.5 inches wide, 23.5 inches deep, 30 inches tall. 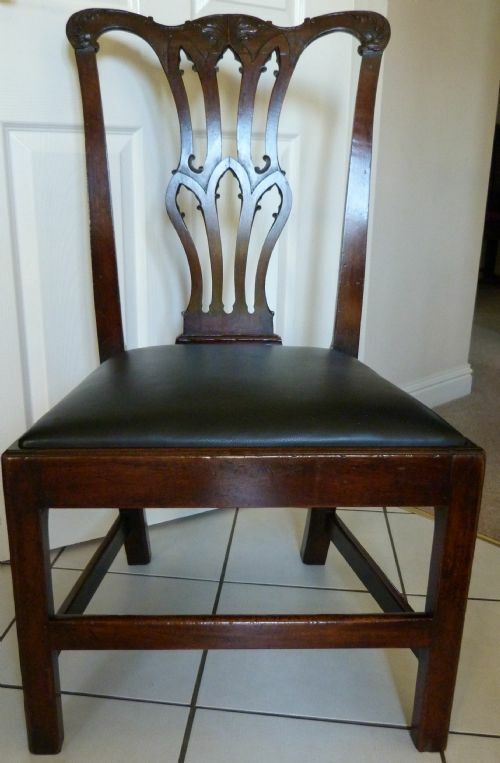 A very fine quality Georgian mahogany chair strongly influenced by Thomas Chippendale. Beautiful crisp carving, excellent colour, the best quality dense mahogany and totally sound. There is old damage to the side stretchers where they meet the front stretcher, not noticeable in everyday use. The seat is covered in good quality black hide. Thomas Chippendale born at Otley, West Riding of Yorkshire, born 1718 – died 1779) was a London cabinet-maker and furniture designer in the mid-Georgian, English Rococo, and Neoclassical styles. In 1754 he published a book of his designs, titled "The Gentleman and Cabinet Maker's Director". The designs are regarded as reflecting the current London fashion for furniture for that period and were used by other cabinet makers outside London. 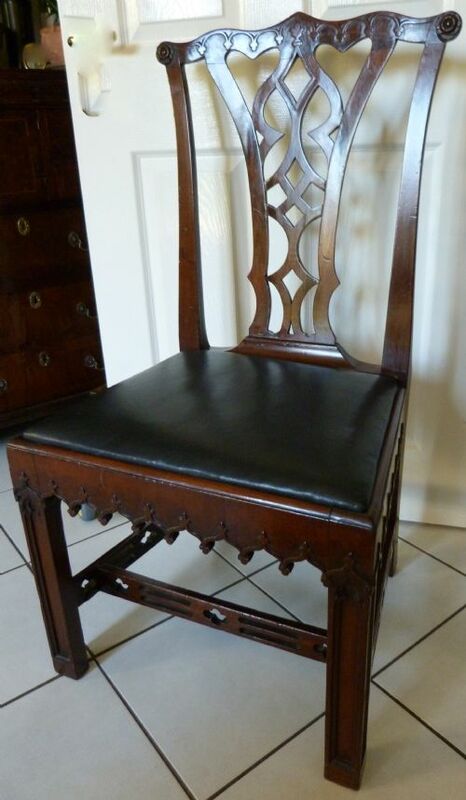 A fine quality 18th century mahogany chair combining Rococo and Gothic motifs. Beautiful crisp carving, excellent colour, the best quality dense mahogany and totally sound. DIMENSIONS: height 39 inches, width 21.5 inches. There are four of these rare chairs, but they may be bought individually, as a pair, or all together. THE PRICE GIVEN IS FOR ONE CHAIR. Three are in excellent condition, firm and ready to use; one is equally sturdy but needs restoration to the front seat rail where woodworm damage has caused the cane to detach. (see image 12) A fillet let into the rail and recaning are needed, for this reason this chair is £595. Magnificent and rich, the quality and quantity of the carving is superb. All are of excellent colour with a good patina. These chairs, with their glorious sculptural quality, are not just a joy to look at but also to use. Although for many years, right up to the present day, these chairs were thought to be 17th century English, we believe them to be Dutch c.1820, in the 17th century manner. There are many Dutch chairs of this period in English collections; research by Dr. Adam Bowett has established that they came into this country in the 1820s to fulfil the need for 19th century 'Jacobean' interiors. They are of significantly higher quality than most 17th century examples. "By the time Percy Macquoid came to write his pioneering work 'The Age of Walnut' (1905) these Dutch chairs had quietly been absorbed into the English canon. Several examples are illustrated in his book and the mistake has been perpetuated in many subsequent texts." Dr Adam Bowett 'English Furniture 1660-1714'. DIMENSIONS: 50 inches tall, 23 inches wide, 29 inches deep (including the rake to the backs), seat height 18 inches. PROVENANCE: Sussex country house collection. 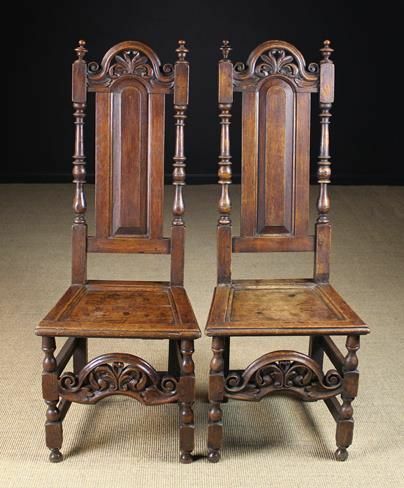 This fine pair of highbacked oak chairs are a country or provincial version of the fashionable walnut and cane backs and seated chairs of the period. Sturdier than their city counterparts, chairs of this type appealed to the more traditional gentry and merchants of England. Well carved and proportioned they are of better quality then many of the caned variety. They are of good colour and condition although one of them has had an upright to the back broken at one time, but long since mended. On the same chair, and perhaps at the same time, one of the finials was broken off and repaired. DIMENSIONS: 49 inches tall, 18.75 inches wide, 16 inches deep. 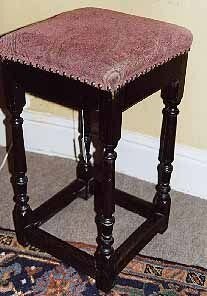 Late 17th/early 18th c. stool. An oak stool, late 17th/early 18th century, with uphostered seat. Good colour and 'crusty' patina. Oak legs and stretchers, pine top rails. Possibly converted from a small 17th c. table. Condition: Good, but see above.